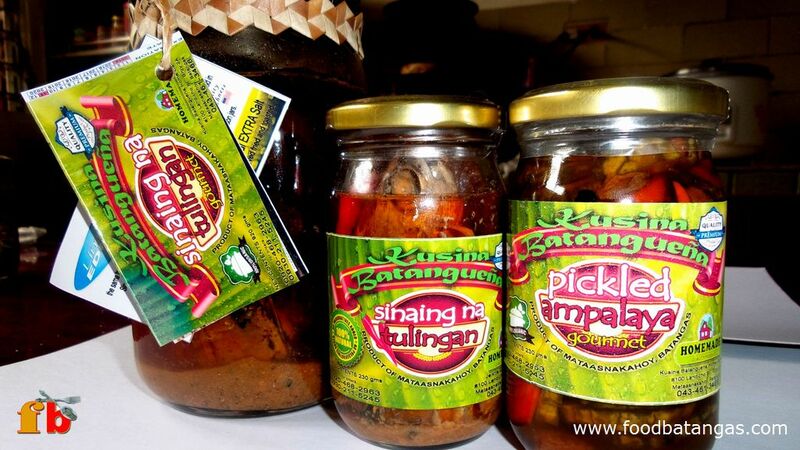 Kusina Batangueña products: sinaing na tulingan and pickled ampalaya. Think of Batangueño delicacies and certainly a few will come to mind. Few will be as iconic as the sinaing na tulingan, however; or so thinks Nestor Velasquez of Mataas-na-Kahoy in Batangas, a food entrepreneur who has reinvented the production and packaging of this favourite Batangueño delicacy. Traditionally, commercial sinaing na tulingan is simmered for hours on end in large earthenware pots and sold in the markets. The understanding, of course, is that it has to be consumed within the day or, if any is left over, fried the next day in what Batangueños humorously call the pinarusahan isdâ. Batangueños who no longer live in the province, therefore, have no recourse but to do it themselves or wait till they come home next to satisfy any craving for the sinaing the tulingan. It is this market, along with the busloads of tourists looking for something distinctly Batangueño to take home, that Velasquez hopes to tap into with his innovative approach to one of the province’s most loved delicacies. With his wife, Velasquez owns and operates a home-based micro-industry called Kusina Batangueña, which bottles the sinaing na tulingan for storage or transport. The packaging says that the product has a shelf-life of seven months; but Velasquez says that in the right conditions, it can last for as long as two years. The couple’s day starts as early as three in the morning to acquire only the best quality tulingan or tuna at the market. Both Velasquez and his wife are sticklers for quality control; and prefer to suspend production for the day if the quality of the fish in the market is not up to the desired standard. 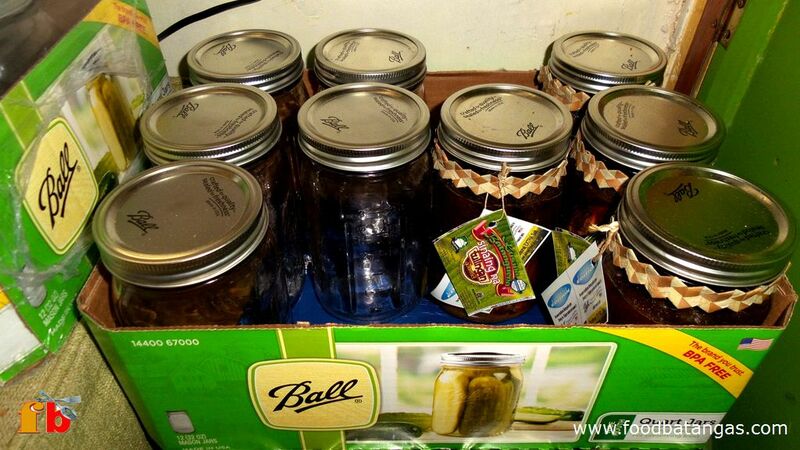 The tuna is cleaned, steeped in brine, bottled and cooked in a pressurized cannery. The entire process is stringent to safeguard against botulism and designed to meet even American food production standards. 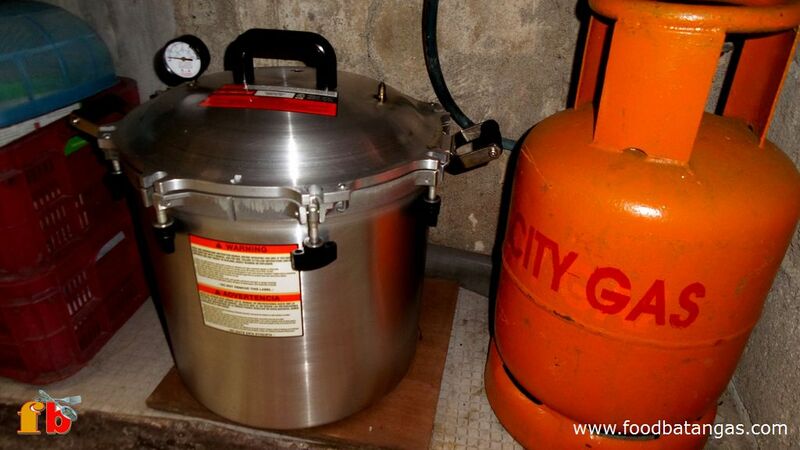 Kusina Batangueña's products are processed inside this small pressurized cannery. Sinaing na tulingan ready for shipping. At present, Kusina Batangueña produces bottled sinaing na tulingan in three variants – plain, spicy or cooked in coconut milk. Velasquez says that he hopes, in the future, to bottle other species of fish such as the galunggong (mackerel scad) and the pautô, a relative of the biyâ or goby which is endemic to Taal Lake. The sinaing na tulingan is made available in smaller bottles with net weight of 220 grams or larger jars with net weight of 920 grams. When the fish catch is lean such as on moonlit nights or during stormy days, Kusina Batangueña instead produces pickled ampalaya or bitter gourd. Kusina Batangueña products are presently sold in an outlet close to Velasquez’s home. They are also available at the La Virginia Resort in Mataas-na-Kahoy for tourists who wish to purchase something to take home as distinctly Batangueño. Velasquez is also negotiating to sell his products in a souvenir stall inside South Supermarket in Lipa City and says that Kusina Batangueña will soon have a shelf for its products inside Robinson’s Place in Ermita. He says that he hopes to eventually package the sinaing na tulingan using cans instead of bottles. This will give him access to courier services and allow him to ship Kusina Batangueña products overseas. For Velasquez, a DLSU-Manila Computer Science graduate who never got to practice the profession that he trained for, shipping the sinaing na tulingan to Batangueños worldwide, may yet be worth more than any software program that he could have written had he stayed in the world of computers. For those who wish to inquire more about Kusina Batangueña and its products you may call or send a text message to 09159305431. Alternatively, you may send e-mail to kusinabatanguena@gmail.com.